Pulmonary hypertension (PH), is a complex and multifactorial entity that affects small pulmonary vessels. It is defined as an increase in the mean pulmonary arterial pressure (PAPm) >25mmHg at rest, assessed by right heart catheterization. 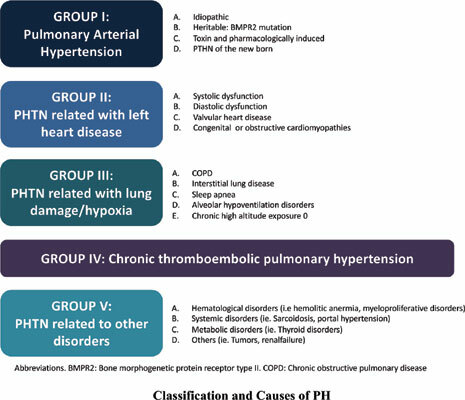 A recent classification divides PH into five types: pulmonary arterial hypertension (PAH), PH due to left heart disease, PH due to lung disease and/or hypoxemia, thromboembolic PH and PH with unclear or multifactorial mechanisms. Several molecular and biochemical factors are involved in the pathway of this clinical entity, although the primary origin remains unknown. In recent years, the existence of a genetic predisposition combined with exposure of environmental factors and triggers has been proposed. In PAH, vasoconstriction, endothelial dysfunction, thrombosis in situ, remodeling of the pulmonary vessel, inflammation and cytokines play an important role in the development of this condition. These pathways are the main targets of the therapeutic interventions in PAH. When feasible, a specific course of action, from drug therapy to surgical interventions remains the mainstay of survival for these patients. This article reviews the pathophysiology of this disease as well as available therapeutic options, specifically for PAH in detail. Cor pulmonale, lung transplant, pulmonary hypertension, treatment, pathophysiology, hemodynamic state.